Being a father of a family of five, all of whom are interested in tech and have one or more Apple devices, I can tell you that you can never have enough spare Lightning Cables. Sometimes I wonder if the dogs are getting hold of them, or maybe my kids just have a talent for dispatching them very quickly. Either way, between this and the occasional cable going MIA, we go through a bunch of them in this house. As the owner of a first gen 12.9″ iPad Pro, I can also speak to the value of a 10 foot long Apple Lightning Cable. If you are using your device less as just a smartphone or tablet, and more as a primary link to the world or home computer replacement, then a longer cable that doesn’t force you to sit one foot from an outlet is a huge help. I still use mine on a daily basis and will never go back. I handle mine with care, but after two years, it is starting to fade and probably won’t make it more than a few more months. This is unfortunate, since Apple now packs a much shorter cable in with the new iPad Pros. This makes a good third-party option very important. All that said, this deal is an absolute no-brainer. Three 10 foot MFi-certified Lightning Cables for $16.99 is a seriously good deal. If you are running short of spare Lightning Cables, then here you go. Look no further. Also, if you’ve never used a longer cable, this is a great way to give one a shot. Once you use one of these, you probably won’t want to go back. 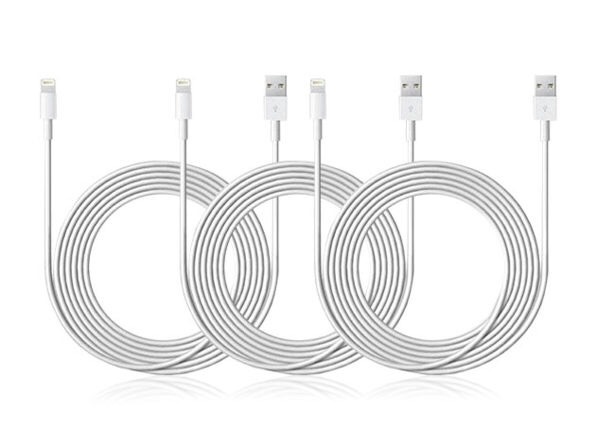 Our Deals site is selling a three pack of 10 ft MFi-Certified Lightning Cables for $16.99. If you prefer a good Giveaway,, our Deals site has two good ones that are getting ready to wrap up. First off, the Binge Watcher’s Giveaway includes a 50″ VIZIO SmartCast UHD TV with Apple TV. You can sign up for this one here. They are also giving away a device that is STILL one of the toughest tickets in tech- The Nintendo Switch. You can sign up for this Giceaway right here. Both of these Giveaways end within the next two days, so don’t delay. Sign up now! !